This Mexican feast combines all your favorite foods. Using 85% lean beef means you're getting plenty of hunger-busting protein, but less saturated fat. 1. COAT a large, nonstick skillet with cooking spray and place it over medium-high heat. Add the beef and cook for 5 minutes, or until it's browned. Drain any accumulated fat and add the taco seasoning and water. Stir until the mixture begins to thicken. Remove from the heat. 2. 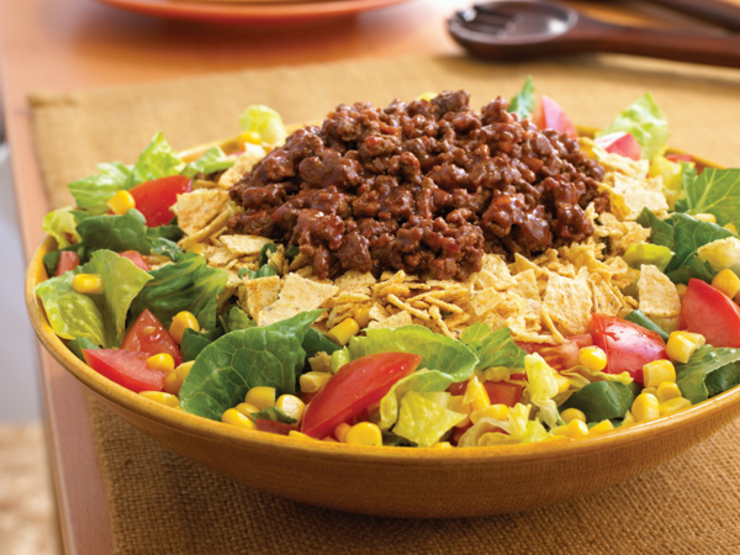 COMBINE the lettuce, corn, tomatoes, and dressing in a large bowl. Toss gently to coat. Top with the meat and the chips just before serving.